So you’re using your laptop, then you trip over the power cord. The next thing you know, your laptop is not turning on. You wiggle the cord and success, it powers back on. You then bump the computer and it shuts off. Unfortunately, you have damaged the DC jack within your laptop and possibly the AC power adapter. Fortunately, this can easily be repaired by one of our Expert Technicians. Here at DFW Nerd Herd in Fort Worth, we see laptop DC Jack issues on a weekly basis. The first course of action is to discontinue using your laptop, as you may cause further damage if there are any shorts in the failed connection. Give us a call and we will come out to your home or office within the Fort Worth area and pick up your machine. Our typical turnaround time for this service is approximately 2 business days; however, if we have to order your laptop’s DC Jack, replacement can take up to 7 business days. 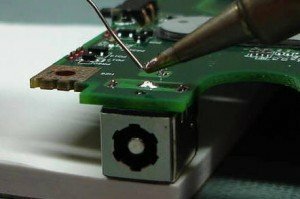 We will professionally remove the damaged DC Jack from your laptop’s motherboard and solder the new jack to the board for years of reliable use (pending no more accidents.) Keep your cords out of the way to prevent damaging your DC jack in the future.